Hey, all! Disclaimer: I’m pretty much stealing the credit for this, as it was Dave’s project. Couldn’t resist, though, it’s a great recipe!! Dave’s an active guy and puts back a lot of protein, often supplementing and snacking during the day on packaged protein bars. I can’t stand eating those, and I don’t like the idea of the preservatives and binders, etc. that must go into making them. I recently started making DIY energy bars, or what I call “bird seed bars,” using a recipe from the Wassner twin’s blog (I’ll post a Quickie on those the next time I make a batch- they’re divine). Anyway, we thought trying a recipe for at-home protein bars would be cost-effective and more nutritious, and our confidence was bolstered coming off of the successful energy bar project. And speaking of being on a bar-making kick, find the paleo lemon bars we made here. 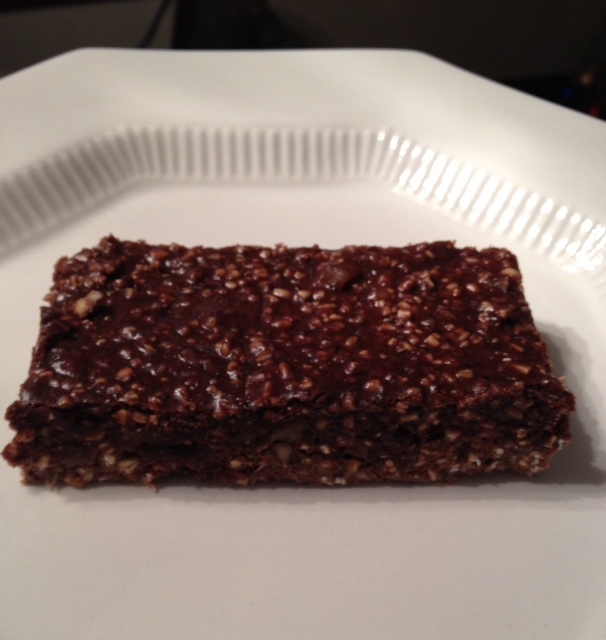 Here are the fudgy, tasty protein bars we made! There are about 15 grams of protein per bar, and they can be made vegan with two simple twists. 1 cup total mixed stir-in options: we used shredded unsweetened coconut, chia seeds, chopped walnuts, and dried cranberries. you could add flax, other chopped nuts, other dried fruits, etc.- use whatever you have hanging around in your cabinets. But not more than a cup total. Easy-peasy throw-in-your-blender recipes… gotta love them. This is one! Preheat your oven to 350 and grease a 9×13 pan. Coconut oil on a paper towel worked well for this. In your blender or food processor, puree the black beans, almond butter, honey, applesauce, vanilla or coffee, salt, and water. Scrape down the sides, if necessary, pureeing until smooth. Add the oats and protein powder and pulse until combined (you may need to stir again). Add your mix-ins and pulse again until combined, stirring if you need to. Spread the batter into the baking dish and bake for 16-20 minutes, until the center is set and firm. Let cool completely and cut into bars (we cut into 12 bars). Keep on the counter for a couple of days, then freeze the leftovers… if there are any. Enjoy! Get your protein on! Look at those muscles…. they’re growing as you read this recipe! Daaang! 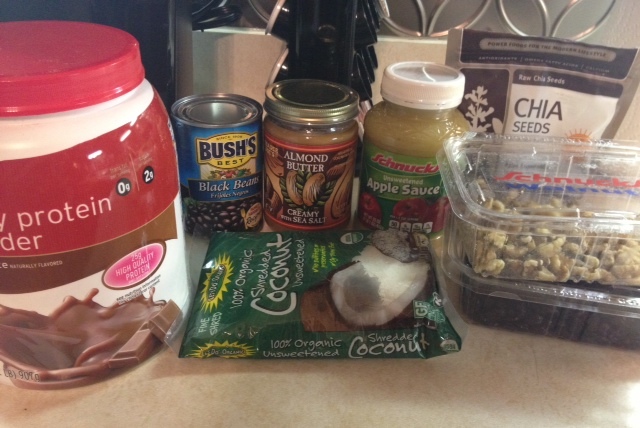 This entry was posted in Baking, Easy, Fast, Gluten free, One Pot, Snack, Vegan, Vegetarian and tagged brownie protein bars, chocolate protein bars, diy protein bars, homemade protein bars, protein bars. Bookmark the permalink. These look wonderful! Quick question – are the oats cooked or not? I could see regular oats going in uncooked, but wasn’t sure about steel cut. Lois, hi!! No, the oats are uncooked. The recipe could NOT be easier!